Whats going on over Christmas?? 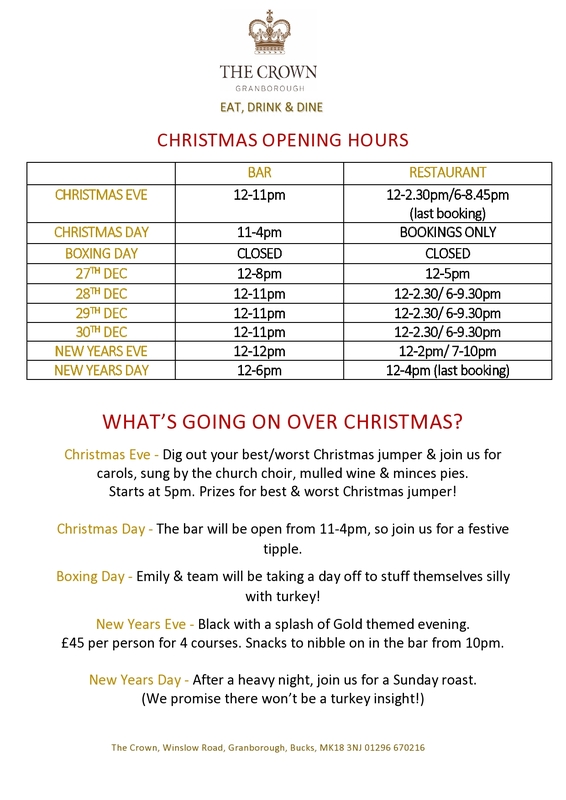 Here is all our events and opening times over the festive period. Christmas Eve – Dig out your best/worst Christmas jumper & join us for carols, sung by the church choir, mulled wine & minces pies. Starts at 5pm. Prizes for best & worst Christmas jumper! Christmas Day – The bar will be open from 11-4pm, so join us for a festive tipple. Boxing Day – Emily & team will be taking a day off to stuff themselves silly with turkey! New Years Eve – Black with a splash of Gold themed evening. £45 per person for 4 courses. Snacks to nibble on in the bar from 10pm. New Years Day – After a heavy night, join us for a Sunday roast.